Modular carpet is easy to install and change. Taking the time to find discount priced modular carpet will save you money on the overall cost of your new carpet installation. It is versatile - Modular carpeting can be moved from room to room as your tastes change. If the carpeting that you installed 10 years ago in your living room is looking a little worn and no longer suits your tastes, it can be easily taken up and moved to say, a children's playroom or basement. Modular carpeting tiles can easily be replaced - Unlike traditional carpeting, if you get a stubborn stain in your modular carpeting, you can simply take up the damaged tile and replace it with a new one, something you cannot do with traditional wall-to-wall carpeting. Perfect for odd shaped rooms - Modular carpet tiles allow you to create whatever shape and size carpeting you would like. Greater personal creativity - If you have been searching for carpeting and just haven't been able to find the perfect pattern, modular carpeting is great because it allows you to create your own unique patterns. Modular carpeting is less expensive than most people think and there are many carpet retailers that offer discount priced modular carpet tiles. Carpet Wholesale - This company's DesignTek modular carpeting starts at under $2 per square foot. ESD Systems - The modular carpeting offered by this company comes in boxes of 20 tiles starting at $40 per box, or around $2 per tile. The Flooring Website - Modular carpet tiles start at $2.50 per square foot and come in boxes covering 20 square feet. If you order 10 or more boxes, the price drops to $1.99 per square foot. Modular carpet adhesive - You can either purchase this adhesive in four- to five-gallon drums that cover up to 900 square feet or buy a spray adhesive for your tiles. Carpet knife - This inexpensive tool is used to cut the carpet to size. T-square - Using a carpenters T-square will ensure that all of your cuts will be perfectly straight. 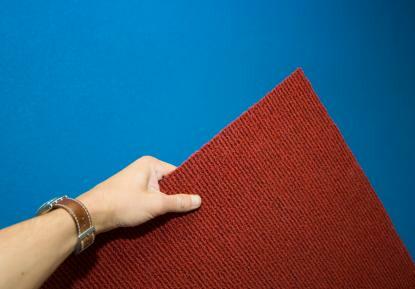 FLOR brand modular carpet tiles operate like a "floating" floor. The carpet tiles come with what are called FLOR Dots, which are round dots that you place on each carpeting tile and not your floor in order to gently hold your carpet tiles in place. You then interlock the carpet tiles, as you would tongue-and-groove hardwood "floating" floors. Once you are finished installing your carpeting, you install your baseboards and you are done! Carpeting is a major home improvement investment, whether you are buying discount modular carpet tiles or having traditional broadloom carpeting installed. If you are installing this carpeting on top of concrete floors, be sure the concrete is thoroughly sealed before laying down your carpet tiles. If the floor is not sealed, moisture can form, ruining the carpet. Finally, take as much time installing these carpet tiles as you would if you were installing a ceramic tile floor. When beginning a dramatic remodeling project like this one, everyone is anxious to see what the finished room will look like, which leads people to rush the project. Taking your time and making sure your modular carpeting is install properly will ensure that you will enjoy your carpet for many years to come.